This is such a sweet moment between Laurel and her sister, Ellie. 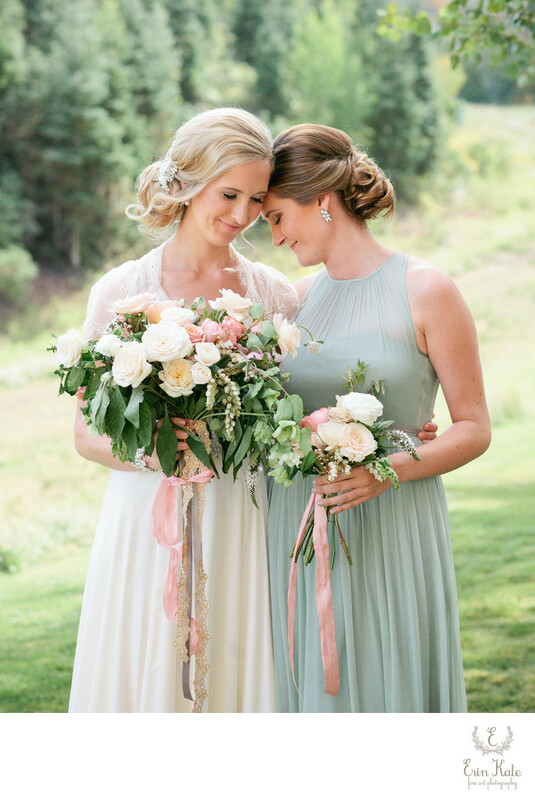 Ellie was Laurel's maid-of-honor on her wedding day. I know it was special day for both sisters because at the time Laurel lived in England and Ellie in Utah so they hadn't seen each other as much as they use to. Laurel wore a stunning gown by English designer Jenny Packham. It had the most beautiful lace overlay on the bodice and the softest flowing fabric on the skirt. Ellie wore a gorgeous J.Crew gown in the softest shade of sage green. It also had a flowing quality that truly complimented her sister's wedding gown. I loved how they wore their hair in similar loose, natural chignons. Laurels was dressed up with a jeweled hair pin by BHLDN. Their flowers were wild garden bouquets by Tinge Floral. They included English roses in pastel shades tied together with the prettiest pink and gold silk ribbon. I chose the side lawn for these bridal party photos where the sunlight is filtered by surrounding trees. The backdrop is also the lovely pine tree covered mountains that make up the Deer Valley ski resort. I will say there is nothing better than a sister. I'm lucky enough to have three and they were the only members of my bridal party on my wedding day. Location: 2300 Deer Valley Drive East, Park City, UT, 84060.